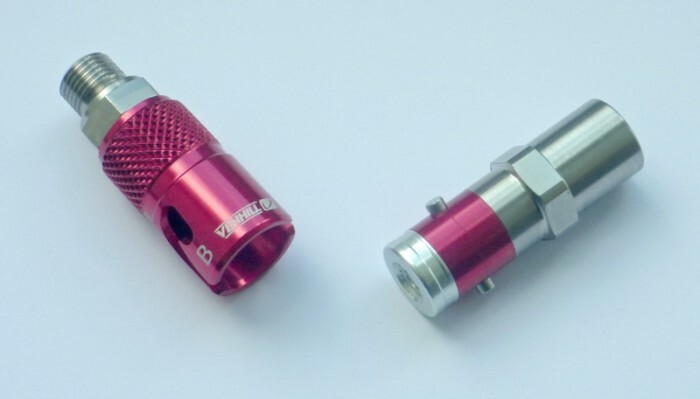 Venhill now have titanium versions of their quick-release couplings available, for braided steel brake lines. Venhill also offers a choice of female and in-line couplings that allow braided brake lines to be separated and reconnected in seconds, without tools or the risk of brake fluid leaking out, or even air getting into the system. Popular with race teams, quick-release couplings hold the hydraulic hose together safely and securely with a bayonet fixing, yet it can be separated in seconds by hand without having to bleed the system afterwards. The male 1/8th BSP thread on the coupling fits directly onto the swivel nuts on Venhill’s Powerhose Plus hydraulic brake and clutch lines; the female side connects to any Powerhose Plus fitting. The Couplings are suitable for use with DOT 4, DOT 5.1 and DOT 5 fluid and the compatible Powerhose Plus lines are available in a variety of lengths, so converting to a quick-release system is also straightforward.